Simple postures to make you feel and look better. 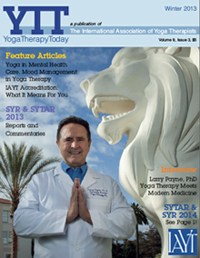 How to use Yoga to relieve stress and put peace back into a hectic life. How to unlock your body’s extraordinary potential, and strengthen your mind. 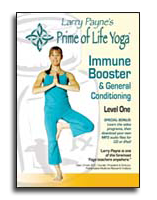 Based upon the book Yoga Therapy Rx by Larry Payne, Ph.D. and Richard Usatine, M.D., the Immune Booster and General Conditioning – Level One DVD shows an excellent routine to help help or alleviate common respiratory ailments, such as allergies and chronic colds. The Level One routines are divided into 20-minute and 40-minute programs and move at a gentle pace, slowly building strength and flexibility. Special Bonus: The disc also contains MP3 audio versions of the routines, so after you’ve watched the video, you can download the audio to play on your iPod or Computer. 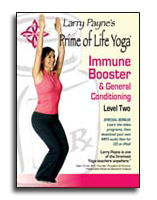 The Immune Booster and General Conditioning – Level Two DVD offers a more challenging routine that adds variety and intensity. 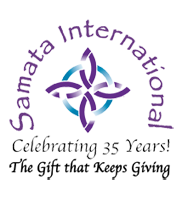 This program focuses on attaining a deeper balance by creating more heat in the body and the use of advanced breathing techniques. Level Two is divided into a 20-minute and a 40-minute program. 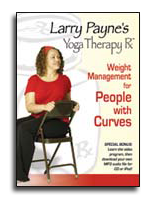 This DVD offers a unique Yoga therapy program to help you manage weight and celebrate your curves. Yoga is a gentle form of exercise that doesn’t strain your heart and helps you develop discipline and reduce the stress that can lead to compulsive or emotional eating. New DVD! 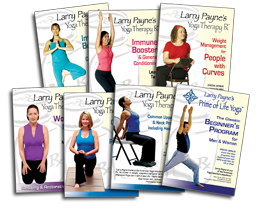 This DVD synthesizes years of research with thousands of Larry Payne’s lower back clients to provide the safest and most effective lower back routines. 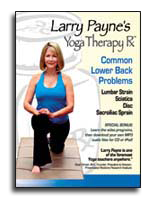 Addresses lumbar strain, sciatica, disc and other common ailments. Not recommended for acute back problems. New DVD! 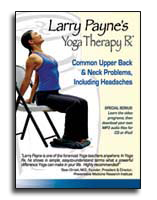 This DVD includes routines designed to help alleviate tension headaches and also provides gentle routines to address chronic cervical strain or sprain. Includes a 12-minute routine and a 24-minute routine. Not recommended for acute back pain or migraine headaches. 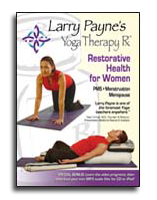 This DVD includes three separate routines to relax and restore: one routine for PMS, one for menstruation, and one for menopause and perimenopause. Each of these routines has been carefully designed to help promote circulation and stimulate the endocrine system, which helps encourage a healthy, balanced release of hormones. Special Bonus: Disc includes MP3 audio versions of the routines, so you can download the audio to play on your iPod or Computer. 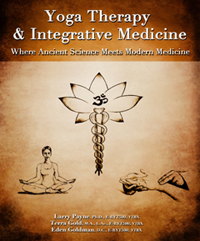 A safe, doctor recommended, introduction to Yoga that is popular with men and women. 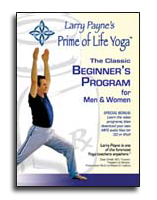 Originally on VHS as “User Friendly Yoga.” Videotaped on location in Malibu, California. Divided into 15 minute and 28 minute programs.